The initial focus of the DSTAR-sponsored research was centered on underground cable system impulse transients, such as those caused by lightning strikes. Failures of extruded-dielectric cables, such as those using cross-linked polyethylene and other materials, have plagued the industry. A major cause of premature failure has been attributed to the cumulative effect of many transient overvoltage events. Minimizing the overvoltages on the cable system prolongs cable life, and the member utilities recognized the need for better information on how to best protect their cable systems. A full scale test system was set up at GE's High Voltage Laboratory to test various cable overvoltage protection schemes. 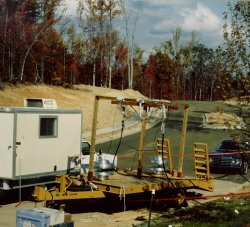 The setup consisted of bare concentric neutral cable buried in a flexible configuration which allowed testing both short (300 ft) and long (1350 ft) cable runs, plus more complex configurations with tapped laterals. One end was terminated at a riser-pole upon which simulated lightning impulses were imposed using the facility's 6 Million Volt Marx impulse generator, shown in the background of the photo on the right. Comparisons were made between various arrester schemes, some of which applied arresters along the length of the cable in addition to the riser pole. An important finding was that overvoltage tends to be more severe in tapped, or bifurcated, cable systems and such systems require special attention when placing arresters. The data from these full-scale tests yielded guidelines now used by the member utilities in optimizing their cable overvoltage protection practices. Underground-system impulse testing continued with attention directed toward other cable types. Jacketed cable is widely used to minimize neutral corrosion problems. The neutral, however, becomes an insulated conductor which can also transmit impulse waves as shown in the illustration below. DSTAR research has shown that the neutral transients can create additional concerns. 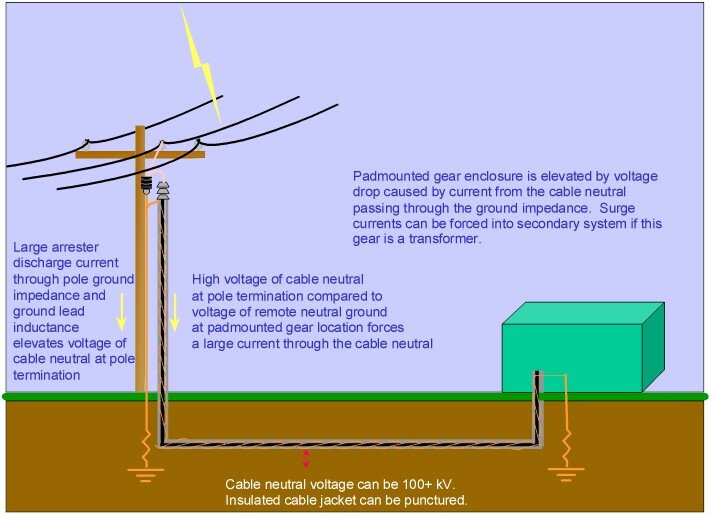 When a lightning surge causes a riser-pole arrester to discharge, the current divides between the riser-pole ground and the cable neutral. Substantial voltages develop between the cable neutral and the earth, and the cable jacket can be punctured. This is particularly true if the pole ground presents a high impedance to transients. Tests have been performed in another DSTAR project to identify the voltage-withstand of cable jackets. Impulse currents on the cable neutral can also find their way onto the secondaries, particularly when the customer grounds are better than the driven rods grounding the padmount transformers. Often this is the case when the customer neutral is interconnected with a municipal water system. This results in the secondary surge phenomenon, which is commonly assumed to be only an overhead service consideration. Secondary surges can result in transformer insulation failure, particularly when the secondary windings are not interlaced. 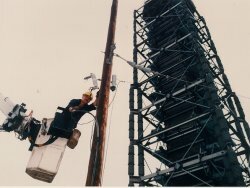 Full scale tests were performed on both interlaced and non-interlaced padmount transformers and the secondary surge performance due to riser-pole arrester discharges were compared. This activity demonstrated that non-interlaced padmounted transformers are susceptible to failure upon riser-pole arrester discharge. DSTAR projects are directed toward finding solutions as well as defining the problems. Considerable research was devoted toward the concept of a bare-wire counterpoise buried along with a jacketed neutral cable. The counterpoise provides a substantial reduction in neutral to local ground voltages. Another important means of reducing neutral transients is improving the riser-pole grounds. Various ground rod configurations were compared using full-scale impulse testing, as well as some innovative concepts such as conductive concrete. The impedance provided by a grounding system to impulse currents is not the same as, nor is it necessarily proportional to, the ground resistance determined by conventional measurements. This was well illustrated by the test results. Another type of cable used by some utilities is semiconductive jacketed cable. This jacket protects the neutral from corrosion but allows neutral transients to dissipate. Tests on semi-con cable type showed substantially reduced neutral-to-ground voltages, compared to normal jacketed cable. However, the neutral impulse current does not dissipate as quickly as it does with bare concentric neutrals. In addition to lightning strokes to the overhead lines feeding an underground system, impulse transients can also appear on cable neutrals due to strokes to the ground near the cable trench. Using full scale testing with an impulse generator, DSTAR research has measured the induced neutral current as a function of ground stroke location. This was performed for bare, insulated jacket, and semicon jacket cables. Although the initial focus of DSTAR projects was on the impulse performance and protection of underground cable systems, the research over the past few years has diversified to also include other areas of current importance. Lightning-generated impulses are but one type of transient to which an underground distribution system is exposed. Routine switching, whether by field crews operating elbows or capacitor banks switched on voltage control, also create transient overvoltages in underground cable systems. As part of a DSTAR project, field measurements of switching surges were made at several sites in a member utility's underground systems. The photo on the left shows the sophisticated instrumentation setup used to capture these very fast transients in the field. EMTP modeling techniques were refined by validating simulations against the field tests, and simulations were used to extend the scope of the research to many more system configurations than could be tested in the field. Guidelines for minimizing switching transient magnitudes were developed. A number of utilities, particularly those operating at the higher distribution voltages, have experienced unexplained flashovers to ground when switching unloaded cables with loadbreak elbows. Building on the previous field switching investigation, another major research project has been performed to determine the causes for these elbow failures.